“Before Glee, I used to play in a lot of bars and restaurants,” Darren Criss said behind the piano at the Beverly Wilshire for Taste for a Cure. 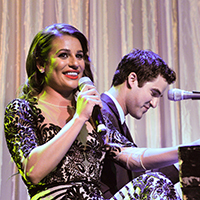 “I would play certain songs so people wouldn’t get up to leave, which is exactly what I am doing to you now.” There were a few valet-dashers, but Criss was so terrific that most butts stayed firmly in seats, especially when he brought fellow Glee-er Lea Michele onstage with him to sing “Over The Rainbow.” He actually auctioned her off (a song and a pic with a fan) and got $5,000 from the gala’s co-chair Dana Walden. It was very sweet, and a surprised Michele fumbled over the tune’s words and pitch a bit. “Don’t ever make me do that ever again!” she said, hitting his arm. All for a good cause. Previous articleWhat Do Lungfish, Salamanders, and Stowaways Have in Common? The 10 Best Things to Do This Week in L.A.